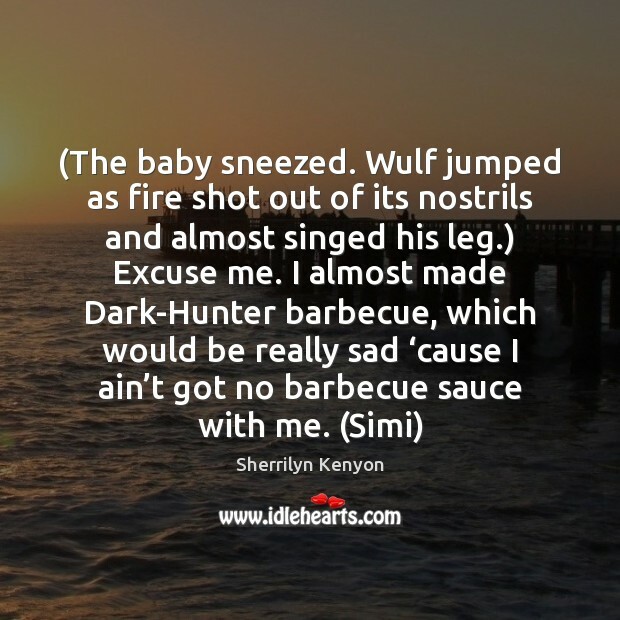 Quotations about Barbecue. Quotes to stimulate mind and drive action! Use the words and quote images to feed your brain inspiring things daily! I do all the cooking in our family. 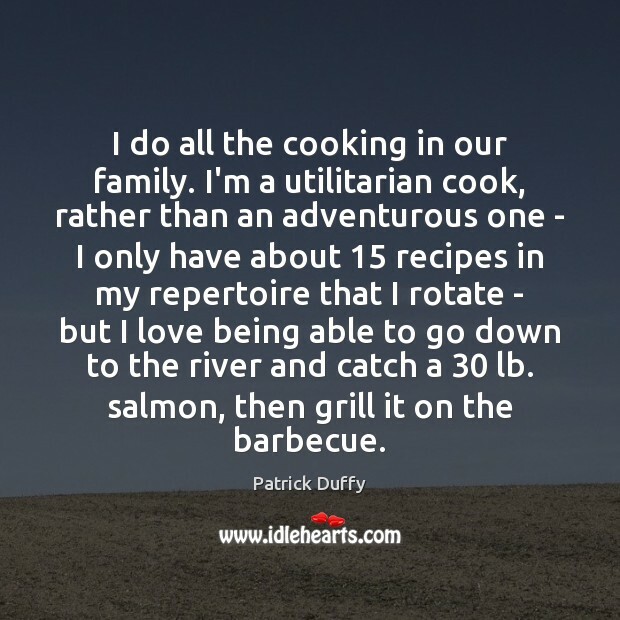 I'm a utilitarian cook, rather than an adventurous one - I only have about 15 recipes in my repertoire that I rotate - but I love being able to go down to the river and catch a 30 lb. salmon, then grill it on the barbecue. 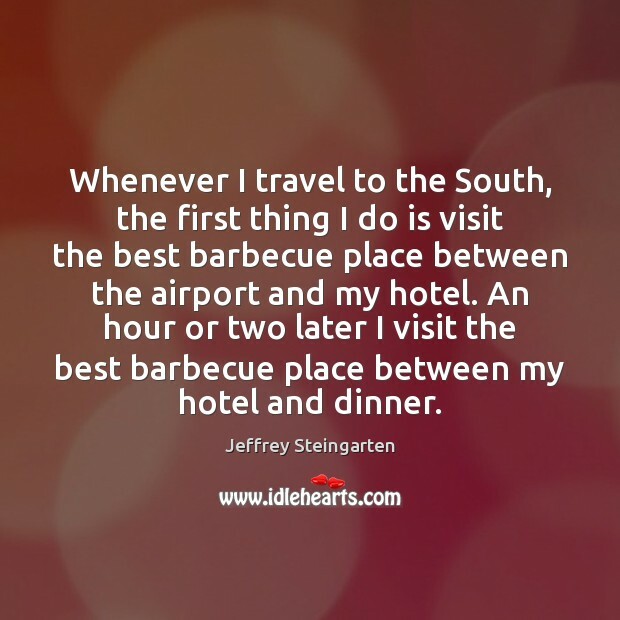 Whenever I travel to the South, the first thing I do is visit the best barbecue place between the airport and my hotel. An hour or two later I visit the best barbecue place between my hotel and dinner. And how did your day go?" 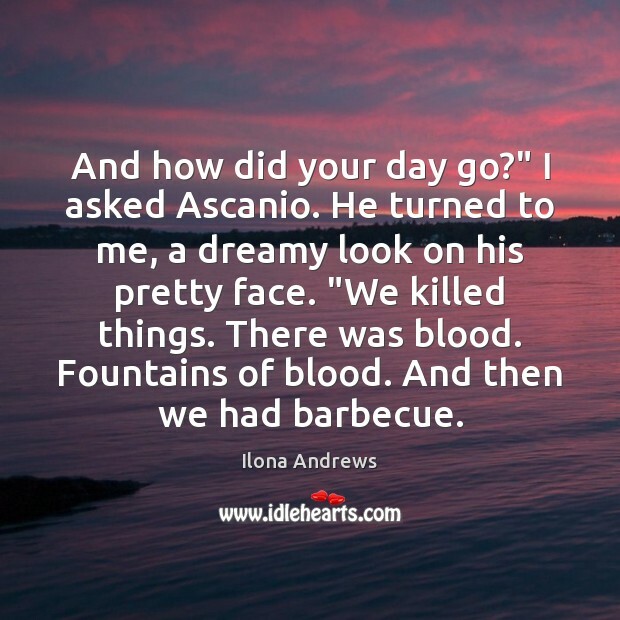 I asked Ascanio. He turned to me, a dreamy look on his pretty face. "We killed things. There was blood. Fountains of blood. And then we had barbecue. In the Barbecue is any four footed animal -- be it mouse or mastodon -- whose dressed carcass is roasted whole... at its best it is a fat steer, and must be eaten within an hour of when it is cooked. 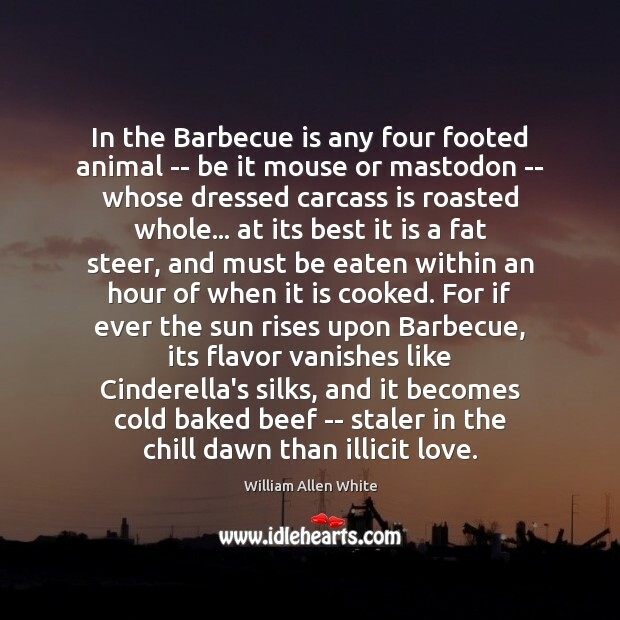 For if ever the sun rises upon Barbecue, its flavor vanishes like Cinderella's silks, and it becomes cold baked beef -- staler in the chill dawn than illicit love. 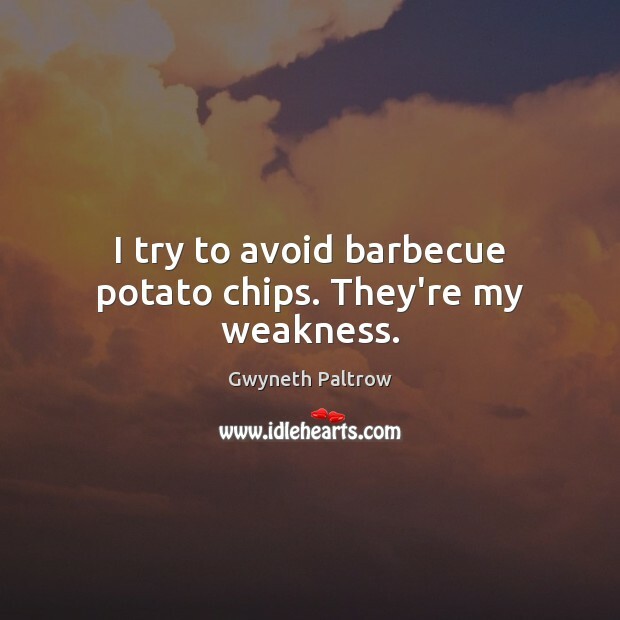 I try to avoid barbecue potato chips. They're my weakness. 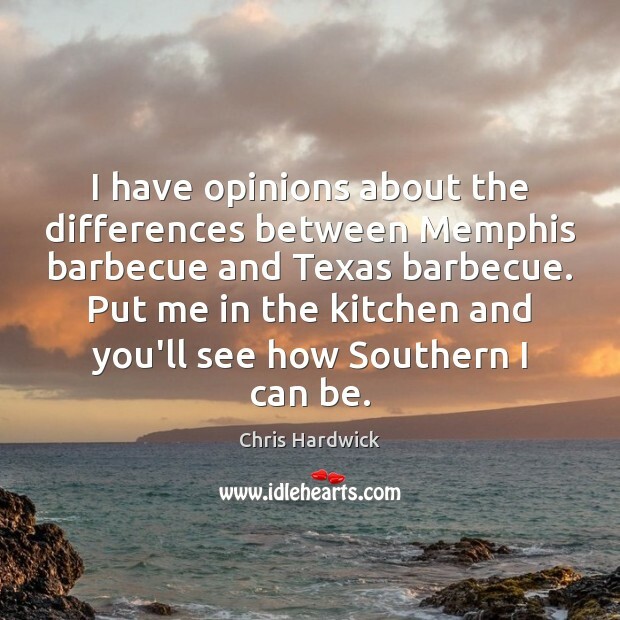 I have opinions about the differences between Memphis barbecue and Texas barbecue. Put me in the kitchen and you'll see how Southern I can be. 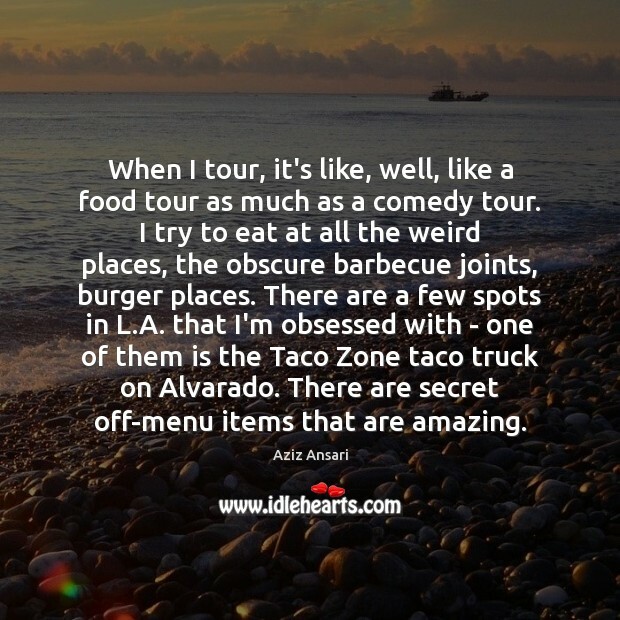 When I tour, it's like, well, like a food tour as much as a comedy tour. I try to eat at all the weird places, the obscure barbecue joints, burger places. There are a few spots in L.A. that I'm obsessed with - one of them is the Taco Zone taco truck on Alvarado. There are secret off-menu items that are amazing. 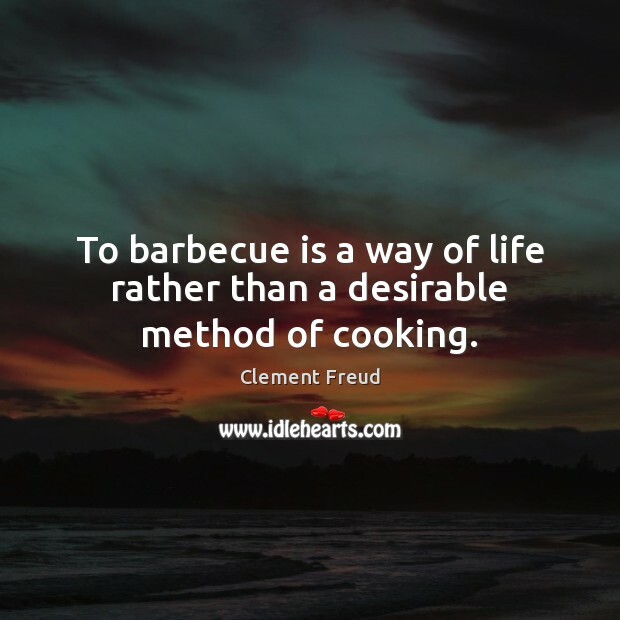 To barbecue is a way of life rather than a desirable method of cooking. 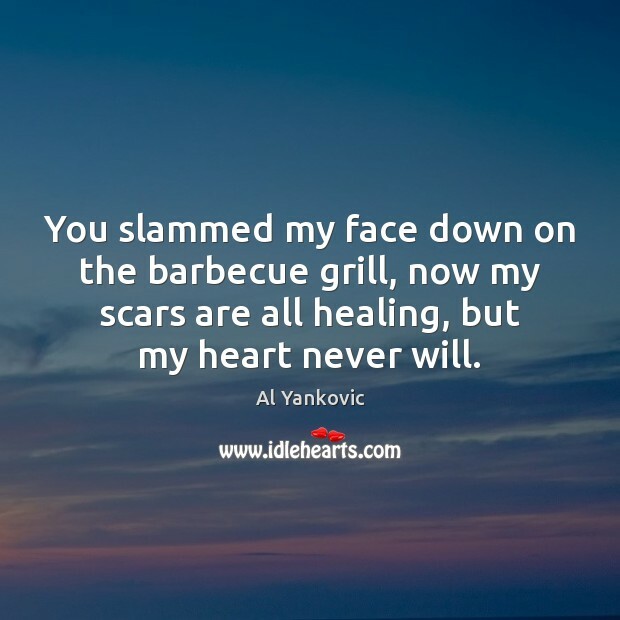 You slammed my face down on the barbecue grill, now my scars are all healing, but my heart never will. 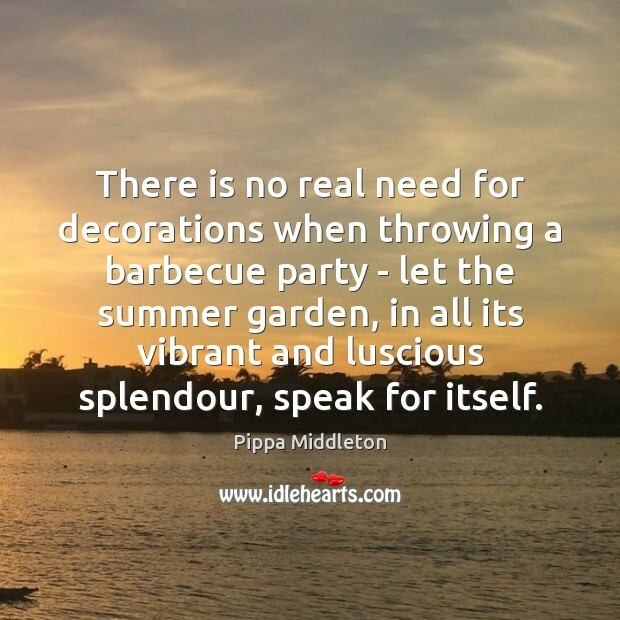 There is no real need for decorations when throwing a barbecue party - let the summer garden, in all its vibrant and luscious splendour, speak for itself. 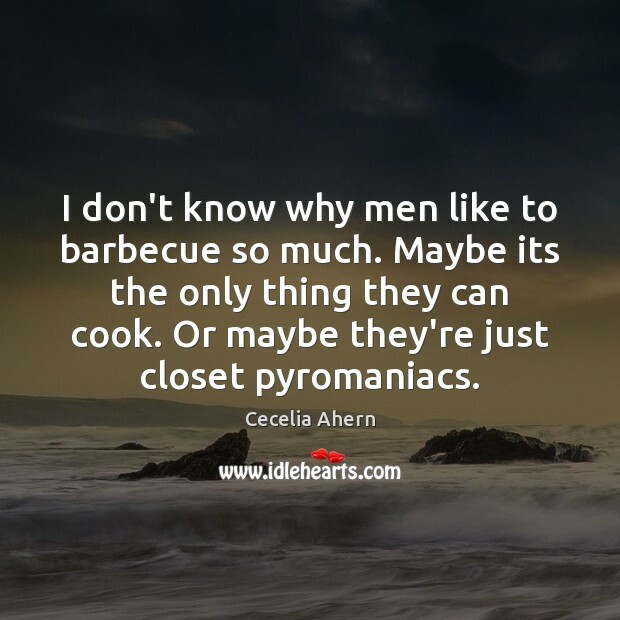 I don't know why men like to barbecue so much. Maybe its the only thing they can cook. Or maybe they're just closet pyromaniacs. 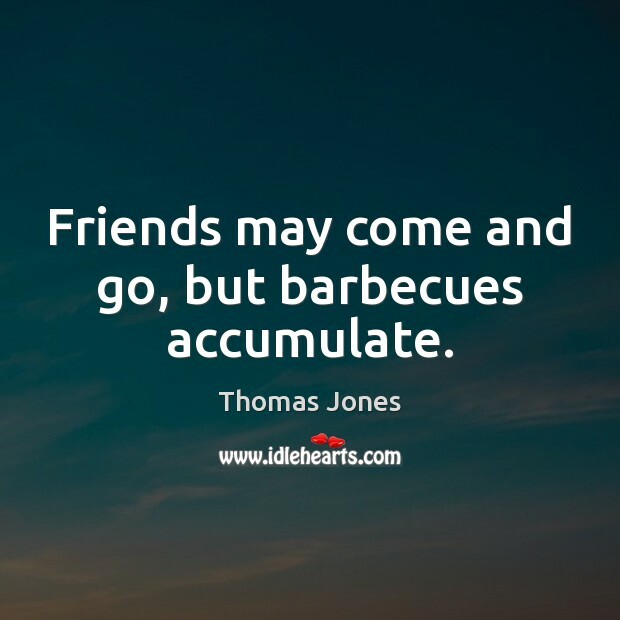 Friends may come and go, but barbecues accumulate. 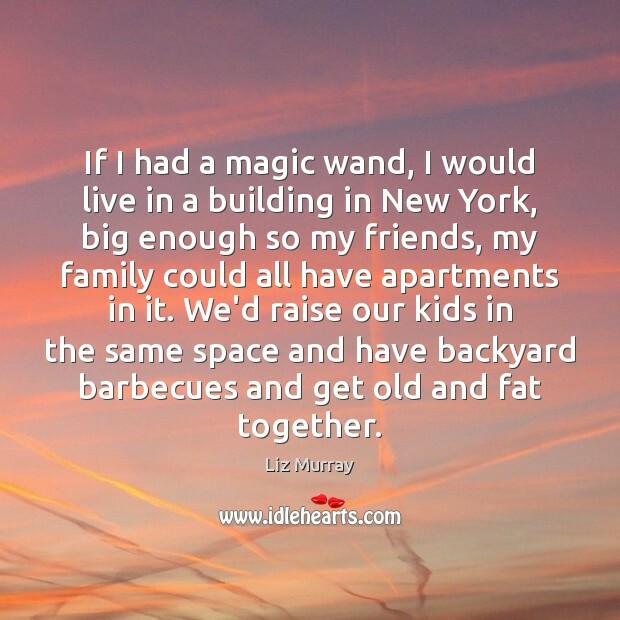 If I had a magic wand, I would live in a building in New York, big enough so my friends, my family could all have apartments in it. We'd raise our kids in the same space and have backyard barbecues and get old and fat together. 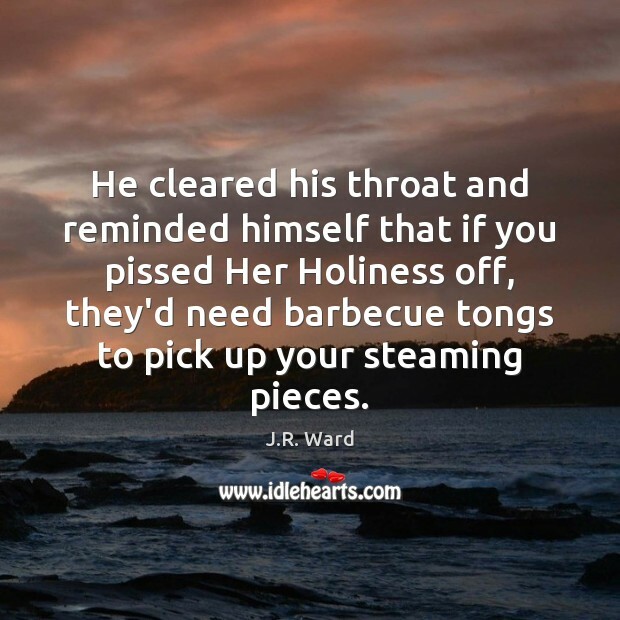 He cleared his throat and reminded himself that if you pissed Her Holiness off, they'd need barbecue tongs to pick up your steaming pieces. I've been on a team that won the world championship of barbecue. 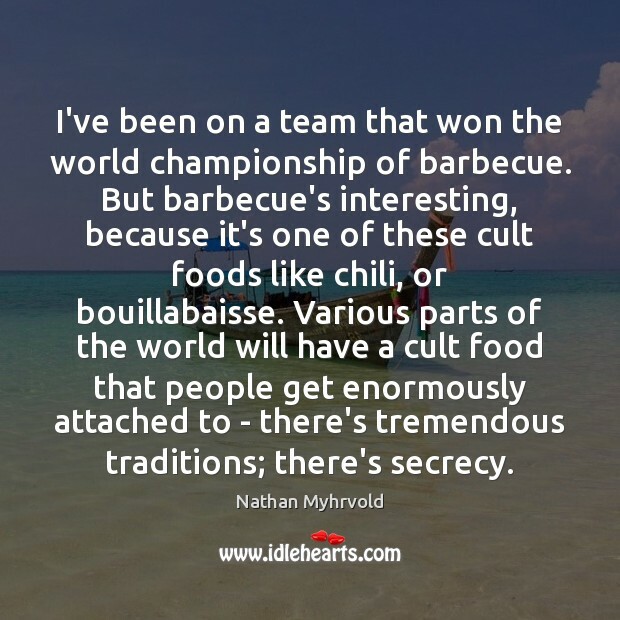 But barbecue's interesting, because it's one of these cult foods like chili, or bouillabaisse. Various parts of the world will have a cult food that people get enormously attached to - there's tremendous traditions; there's secrecy. 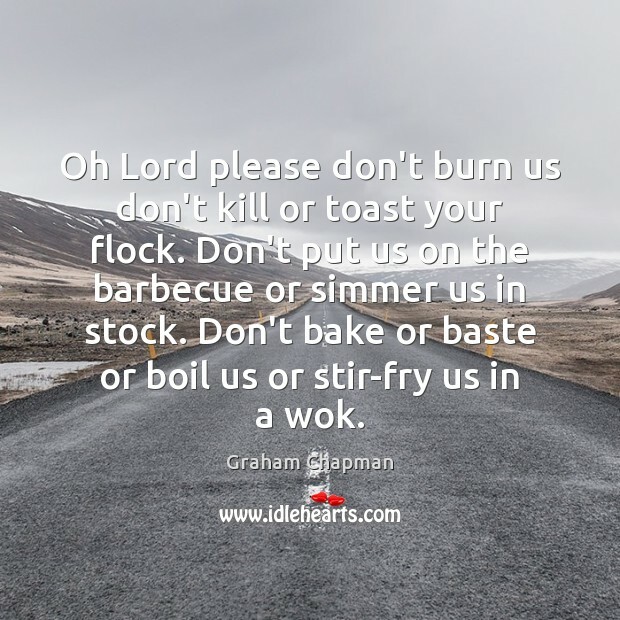 Oh Lord please don't burn us don't kill or toast your flock. Don't put us on the barbecue or simmer us in stock. Don't bake or baste or boil us or stir-fry us in a wok.